The new General Data Protection Regulation (GDPR) is the most important change in data privacy regulation in 23 years - impacting every organization inside and outside the EU which process personal data of EU citizens. The regulation is complex to understand and fact specific, meaning your GDPR program will be unique from another. And many people might think that GDPR is just an IT issue and compliancy can be achieved by using any single software solution, but that is the furthest from the truth. Join Danny Allan, Veeam’s Vice President of Product Strategy and Greg Schulz, Founder and Sr. Advisor of the independent IT advisory and consultancy firm Server and StorageIO, as they discuss the challenges many organizations are facing around GDPR. 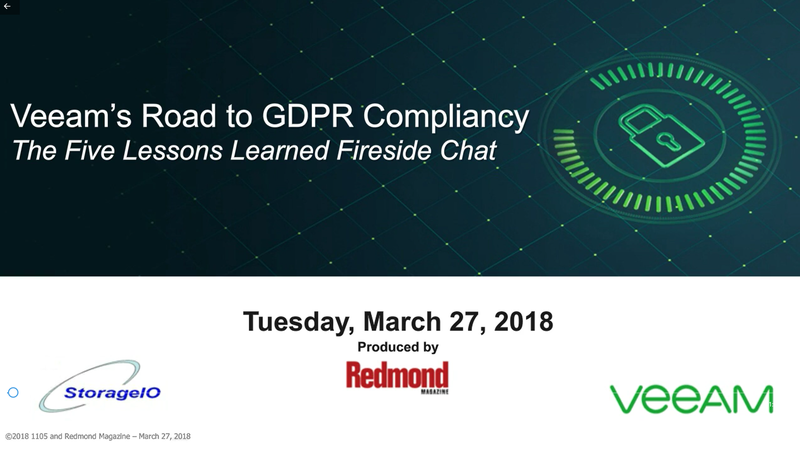 They will review the five key lessons learned during Veeam’s road to GDPR compliancy and how Veeam’s software solutions played a critical role within our own data management and protection strategies.